Inspired by our favorite "Sweet Summer Belle Dress," the vintage Elegant Tea Dress is just as wonderful! The black and white print of this dress makes it perfect for upcoming holiday events, an evening out, or a day spent in the city. 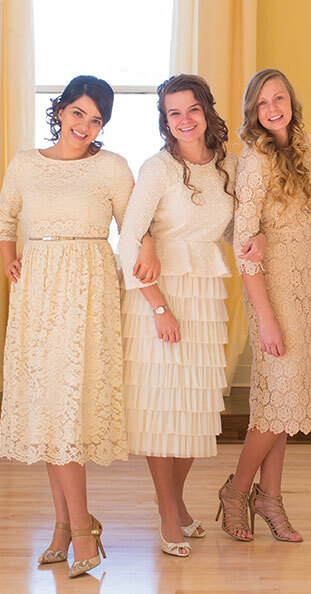 The modestly fitted bodice and flared skirt are so flattering! Back zipper. Sash included. 100% polyester. Love how it fits me!! I feel beautiful and most of all modest!! This dress is stunning! I have a very defined waste with much larger hips and this dress is perfect !!!!! It's the first dress I ordered from dainty jewells and it was so worth it! I ordered the maxi length and it fits perfect and comfortable and the material is light and flowing and Amazing! I was able to order my normal dress size (true to size) it is wonderful! A defiant recommendation for a first dress purchase! Will certainly by the summer belle option!! This dress should come it dif designs and solid colors!